some time back, when my friend first started collecting knifes and such - his grandfather gave him a knife he had laying around for years. back when we were young we just thought it was cool, and never really thought to look into it too much. for years he thought the knife was really old. 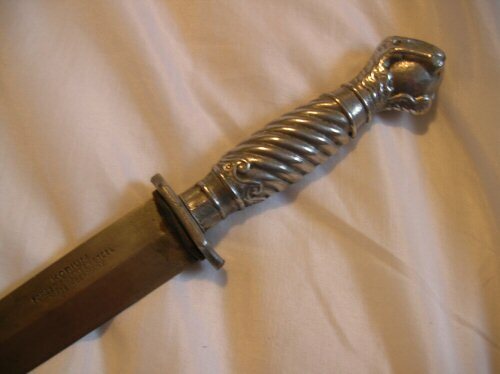 possibly from when his family migrated here to the states back in the 20s and being that he came from an Italian family with a colorful background he wounder at how old the knife could be. i had seen this knife here on the forum once before posted up with what looked like a set by the same maker of art like knives. i remember the one featured in the post had a grip of a woman, and next to it was this knife. i assured him that the knife was not that old. but he asked me if i could find out more about it. so i jumped here to see if anyone can help me identity this little knife. the grip of the knife is pretty much its signature, to my eye its cast aluminum made up like an eagle's talon gripping an orb. the quillon block is also cast, and the quillons themselves have broken off. the blade itself is actually by my estimation pretty good quality. it's stamped Korium, forged solingen steel. the blade is freckled like a D2 steel, and no real pits of rust. what i always thought was interesting about this knife is the little leather bushing it has above the quillin block that has no real purpose that i can tell, my only theory is that it seals the blade in the sheath a little better or acts like some kind of rain guard. It's good that yours is an older one, as I believe they still make a knife very similar (if not identical) that is made from stainless steel somewhere in asia. An interesting looking knife to keep for sentimental value, but unfortunately, I believe the were cranked out by the thousand over the last 50~ years or so. Regarding the patina, it is not uncommon for a knife to rust/patinate in a speckled pattern, particularly if it already has a little bit of an oxide coating or if it is from moisture in the air, rather than submersion. To the best of my knowledge, it is not based on or a replica of anything - just an original knife made for mass production. As mentioned above, though, interesting looking with sentimental value is about all that's necessary in an art knife IMO! It is quite possible that I had posted an ad in more than one thread. Give me a second her and I'll post that up. The talon and ball daggers were made by a number of sources but the Korium probably the most common you will find. The quillons vary a bit between the separate Solingen sources and then there were the Japanese Korium knives. IF you plug Korium into Ebay, you will see the traffic of both German made and Japanese examples. Most notably is the scabbards between the two. A quite different build done by Jowika, before the company moving to Ireland from Solingen. Those Jowika knives earlier, so the motif predates the WWII period. All the alloy gripped hilts are 1950s to the 1970s. It was some time in the late 1960s when the Korium name went to Japanese manufacture. These were my childhood dream and I had a plastic one when I was three. In the 1960 magazine and comic sales, it ws often of a penny being pierced. Some New Yoork out fit and I am forgetting the name of the distributor. I may have that in files as well. Here is mine, I was recapturing my youth after a stroke a ew years ago. These do rust and you can see in the above photo I must have not attended to it in a bit. Here is one of the Ebay ads from some time ago and I had saved it because there was a relic having been sold as old. And then the sad truth of a notable Civil War dealer selling the piece as old but going by the source of the story. The dealer could only add to me after the sale "That sure looks like our gal, buy all you can "
A good day for finding or a good day for drinking? Let me see if I can find that Jowika in my files and maybe some other ad copy with the pierced penny. No luck on the penny ad on my current drives but it is out there on the net. The pre war Jowika blade shape a bit different. So anyway, the post war fad was a nod to an earlier pattern but as far as I know not so but often listed as a military pattern. The blade washers are to help keep the blade to guard wear to a minimum with the alloy pieces. and with many o,ld swords, a part of assembly. By the 19th century, we often see the washer just acting as a bumper, or grease seal but even up to the 20th century a regular part used in seatling the blade to the guard (which is why so many 18th and 19th century military swords have a gap and loosness as the washer degrades). I'm sorry I'm going off topic here but I'm new at this forum malarkey and don't know how to start a new thread! I've been left about 30 swords and ?gurkha knives? in a will and I'm struggling to identify them. I'd love to know more about their history. 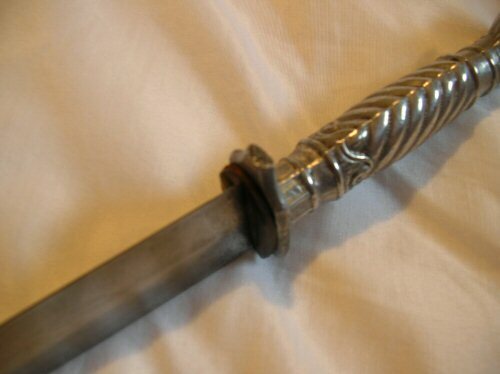 I've managed to identify one sword as a 1897 British Infantry Officers sword but am stumped on the rest. Can anyone point me in the right direction? On the top right of the forum display, below the text that says 'Log out [ Henri Moss ]' there will be an orange box that says 'New Topic' You will probably get more responses if you go ahead and post a new topic. If you can, images of the swords/kukris and any markings they have would be invaluable. Unfortunately, without knowing specifics, it's hard to point you towards good reference material, simply because there is such a vast number of makers and sword types over the last few hundred years; you could probably trawl through books for hours before identifying one! Are they all of the same type, for example, as the officers sword or do they vary? Some are so old I'm scared to touch them! My favourite is a blade hidden in a walking cane with a really pretty inlay in the handle. There's another with R Sextons & Sons ....St Dublin just below the hilt but the name of the road is illegible. I've even got an Aboriginal spear! I'll try and start a thread with some pictures...wish me luck!